California cuisine may have a reputation for being healthful and creating the kale craze that has swept the country, but Californians also love their junk food too. In fact, hot dog stands across the state have big reputations for toppings that are anything but doctor-recommended. 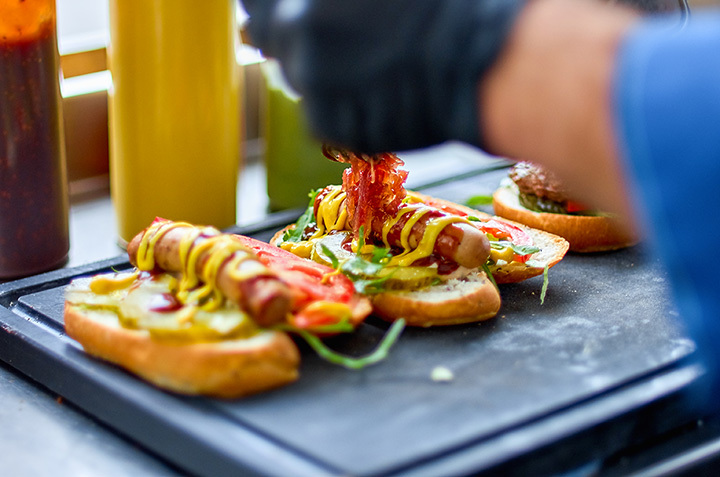 From Southern California’s love of chili dogs to creative toppings, clever names and celebrity-endorsed meat tube delights, check out 10 of the best hot dog joints in California. Pink’s may be the most famous hot dog stand in the country, or even the world and it’s just a humble little walk up on a corner in Hollywood. Although Pink’s has other locations around the country, the original location is the one that is best known for playing roles in movies, TV shows and skits and has celebrity fans that line up for a taste of the creative named dogs and unusual fixings named after films and celebrities. Once upon a time there was Cupid’s dog in many locations, although now they are limited to select neighborhoods. For a true taste of Southern California, nothing is better than a Cupid’s chili dog, one of the best examples of the dish anywhere in the city. Carney’s is best known for its unique train location that makes it standout from other hot dog stands. Décor aside, Carney’s is a good spot to hit when you’re craving a chili dog and side of fries. There are other toppings for dogs, as well as burgers but the chili dog is the standout. When the boys in blue are having a bad season, the best thing about the game is the Dodger dog that helps ease the sting. And when the team is winning, the hot dog tastes all the better. You can also find Dodger dogs at select locations outside the stadium in the Los Angeles area. Portillo’s hails from the Windy City but the West Coast outlets offer the same classic Chicago dog and even the famous cake shakes to wash them down. Check out the kitschy décor while you wait in line for a delicious hot dog. There’s more to Berkeley than a bunch of socially conscious vegans. Top Dog has been a student hangout for decades and shows no signs of going anywhere thanks to an extensive menu of international hot dog variations and fillings. Located in an unassuming strip mall, Wiener Works offers oversized hot dogs and other meaty goodness along with cheap beers and freshly made fries. Low prices, good foods and not a lot of bells and whistles make Wiener Works a good stop for classic hot dog lovers on a budget. The small Hotdogger has become a major hit in Davis. Late night hours and a variety of themed hot dogs and sausages have made the Hotdogger a popular hit in town and worth checking out. If you’re not into pork, the menu also includes vegetarian and chicken options. Duff’s Doggz is a classic stand in the middle of a parking lot with low prices and a huge variety of state-themed dogs. Without traveling the country, you can have a taste of Chicago or New York. Or even the islands with a pineapple salsa topped option. Annie’s Hot Dogs are convenient stands located all over the city. As one of the first carts to hit the streets of San Francisco, they make an excellent snack during a day of sightseeing. There are a bunch of toppings available, including a red onion sauce that regulars swear by.